As we lamented the gravity of major issues facing our world and laughed at the absurdity of some of own fears and foibles, I recalled a quote from Through the Looking Glass and What Alice Found There by Lewis Carroll. Carroll was a pen name for Charles Lutwidge Dodgson, a nineteenth century author, mathematician, photographer, and Anglican priest. 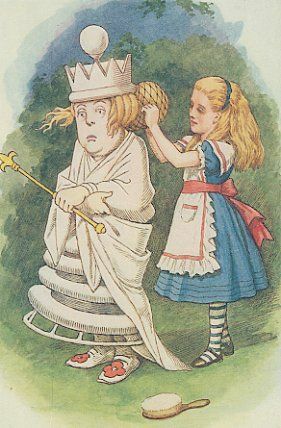 I can’t help but believe that the popularity of Lewis Carroll’s books stems from Alice’s conviction that very few things are really impossible. As we enter a new year, what things do you believe are possible that the rest of the world would write off as impossible and foolish? As you ponder the most difficult challenges facing our country and world, how do you believe God is calling you to act? As you pray about the future of The United Methodist Church and the work of the Commission on a Way Forward, how is God asking you to have a heart of peace in the midst of anxiety and fear? Here is my list of twenty impossible things that I believe and am committed to working on in 2018. It is possible to live a life of holiness by loving God and our neighbor (which means all neighbors, not just some). It is possible to see Jesus in everyone we meet, including those who are not like us or those whom we do not like. It is possible to take a leap of faith and empty ourselves of the need to judge, condemn, or keep score. When we ask in exasperation or despair, “Are we there yet?” it is still possible to make a commitment to be part of the solution, not the problem. It is possible to engage in deep listening and dialogue and learn from those with whom we disagree. It is possible to recognize that the need to win drains us of Holy Spirit power. It is possible to follow John Wesley’s Three Simple Rules in all that we say or do: do no harm; do good; and stay in love with God. It is possible to resist the impulse to be oppositional or reactive and instead be a calm, loving presence, even when we have profound differences. When we are on unplanned journeys that are not of our choosing, or when the journey is taking longer than we think, it is possible to relish the adventure and the opportunity to grow, persevere, learn from failure, and deepen our faith. It is possible to treat others with the grace and tenderness with which we want to be treated. It is possible that our disagreements around human sexuality do not have to threaten our unity in Christ in The United Methodist Church as, together, we make disciples of Jesus and transform of the world. It is possible to let go of old hurts and forgive from our heart. It is possible to devote our life to reconciliation, just as “God was in Christ reconciling the world to himself, not holding anyone’s fault against them” (2 Corinthians 5:19). It is possible to make a difference by being an encouraging, loving, and healing presence to everyone we meet. It is possible to open wide our hearts to the needs of all of God’s children in our world. It is possible to humbly lay aside all of our misconceptions, prejudices, and biases to see people as God sees them. It is possible to empty ourselves, stand with those at the back of the line, sit with those who have no hope, and walk beside those who see no future. It is possible to live creatively, compassionately, and hopefully in the midst of change and loss. It is possible to treat ourselves gently and take the time to nurture our mind, body, and spirit. It is possible to give, expecting nothing in return. What if we all paused before breakfast every day to practice believing something impossible and then use the rest of the day to make it happen? After all, so many out-of-the-way, out-of-the-box, beautiful, life-giving things happen every day that maybe, just maybe, very few things really are impossible. Thank you, Bishop Laurie, for the 20 good “possible” resolutions for 2018–if we believe! I’ll pledge to try! Thanks Laurie. Six impossible things before breakfast! I think you are right that maybe we start with one. I appreciate the encouragement. Wisdom in the way of Christ. Thank you for your thoughtful words and the comfort they bring. At age 77, I have never seriously considered making a New year’s resolution. You have beautifully and succinctly articulated twenty “possibilities”. Thank you for reminding me that “with God all things are possible” and for giving me renewed purpose. Thank you, Bishop Laurie, for these encouraging and inspiring words. I look forward to and get so much from your posts. I pray blessings upon blessings to you and yours, and for ‘impossibilities made possible’ for the UMChurch in the Year of our Lord, 2018.